Tommy Bahama Lifestyle Beach House. Only 212 Steps to the Beach! Pet Friendly! Please call, text or email us for the BEST possible rates that work best for you. Please look at all of my positive reviews! You can now you stop searching because you have just found the perfect beach home! Make your next vacation one you'll remember for a lifetime in this updated 3 bedroom, 2 bath beach home! Only 212 steps to the ocean! The elegantly decorated and spacious living room features a HDTV, DVD player and access to the private, screened in private lanai. The stylish dining area features seating for 6 and 2 bar stools for extra seating at the kitchen counter. Fix a meal fit for a king using new appliances in the fully equipped kitchen which offers access to the garage. 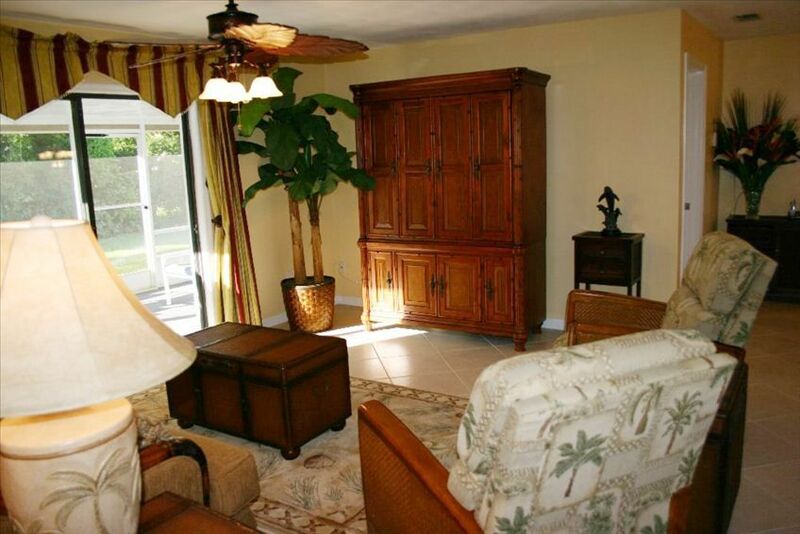 The lovely master bedroom features a king size bed, HDTV with DVD player, access to the lanai and a private master bath featuring a walk-in shower. The upscale 2nd bedroom features a queen size bed. The nautical themed 3rd bedroom features HDTV with a built in FVD player, a bunk bed with a twin on the top, a double on the bottom and a pull out twin trundle. The 2nd bath features a tub with shower. This beach home features a large private, screened in lanai providing beautiful, lush Florida vegetation providing the privacy. There is cozy patio furniture with seating for five to enjoy your boat drinks as well as seating for four at the patio table to enjoy breakfast, lunch or dinner. There is a washer and dryer located inside the home. A unique benefit of this beach home is vast amount of off-street parking for boats, trailers, motorcycles or cars of visiting friends and family. Enjoy full cable TV, and secure broadband and wireless internet. Enjoy the outdoor shower to rinse off the sand after a memory filled day at the beach. Please keep in mind that the beach home sleeps a maximum of 8 people. But don't worry, there is plenty of closet space and dressers to unpack and enjoy this beautiful beach home! This is a perfect place for your family and any friends or relatives that will want to visit you at this stunning beach home! Relax in Paradise - Only 212 steps to the beach!!!!!!!!!! 1-Car Garage used for storage of bikes and beach toys, chairs and cooler. Living Room with a large Smart HDTV and DVD player. Total seating in the beach house is for 8. Large screened in Lanai with cozy patio furniture with seating for six and outdoor table with seating for six. Plenty of off street parking for boats, trailers or visiting friends and family. Boogie boards, beach towels, beach chairs, cooler and many other things to make your beach week a blast. 2 beach cruiser bicycles for a romantic ride on the beach. All linens and towels are supplied. Prefer Saturday check in and check out. If these times will not work for you, call me and we can figure out a solution. Fees: I hate taxes, but by law I am required to add a 12.5% sales and resort tax to all rentals less than 6 months. As a little boy, my family always drove from Maryland to New Smyrna Beach for vacation. I told myself that someday I would own a vacation beach house in New Smyrna Beach because I loved the beach and Disney World. As an adult, I realize there is even more reasons to vacation in New Smyrna Beach! Now I want to share my wonderfully relaxing beach house with you! The beach house is very upscale as you can see from the photos. Plus, pet friendly for most pets! The ocean is literally only 212 steps away (you can hit a baseball from the house and it will hit the beach). Very close and convenient to come and go to the beach from the house in no time without any effort. Everything you could want is provided including high speed wireless cable internet, bikes, beach chairs and boogie boards. Every family/group that has stayed has loved their vacation! toilet, shower, Handicap accessible since step down into shower 3 inches. toilet, combination tub/shower, Toilet and Shower/Tub is private from the bathroom vanity. Master bathroom has plenty of light above and to the sides of the mirror. Also, dimmer switch for night time use. Shower is a walk in so nothing to step over for your safety. HE Front loader washing machine. Used for storage of beach toys, chairs, bikes and boogie boards. Boogie Board and surf board. Bikes, boogie boards, coolers, beach chairs and beach umbrella are available for your use. Super clean! Close to everything! Great house. Perfect location. The house had everything we needed for a perfect vacation. The house was in a great location. Very close to the beach. Chairs, toys, umbrellas were all provided to use on the beach. The owner was attentive and responded to all of our needs in a timely manner. We rented a golf cart for a few days and used it for shopping, beach riding etc. The house is located near shopping, restaurant, etc. The house had a grill which we used on several occasions during the week. The house is everything that it is advertised to be and more. We enjoyed the week and hope to return in the future. We would definitely rent this house again. My only complaint was the weather since it was too hot to use the back porch -- but great size for a larger family and the amenities in the house and garage were so helpful! Great location in New Smyrna Beach! We really enjoyed our stay at this beach house! Everything was just as described - a short walk to the beach (a nice, uncrowded section of the beach), comfortable rooms, and a great stock of beach chairs and other supplies. There is a grocery store just a short drive (or 15 minute walk) away and an ice cream store just down the road. We loved the location and the house! Location is everything and you get what you pay for! I am very happy you and your family had a wonderful vacation! Thanks for the review so others can see how great the beach house is to enjoy a Florida vacation! One of our best vacation EVER!!! This was our first visit to New Smyrna Beach. We could not have asked for a better experience. This house was perfect. Dale has made sure that you have everything you could ever need at the beach. Chairs, coolers, surf/boogie boards, there was even a stack of beach towels just in case. The location is perfect. Just a short walk to the sand and you are in an area that is not busy. Even with the cars driving on the beach it didn't ever seem crowded. The house is set us perfect for families. My son loved the bunk beds. The kitchen has everything. All we had to do was go to the store and get food. Dale takes care of everything. When we went to go for a bike ride, yes there are two beach cruisers there to use, and found that one of the bikes was not working Dale had a brand new bike on our back porch the next day. With everything being so close you can bike to stores, bars, and restaurants. If you are looking for a wonderful house and a great location, this is the place for you. We are looking forward to a return visit. I am happy you had one of your best vacations ever! I don't spare any expense to make sure each guest has a wonderful time at the beach house. If something is not right, I will make it right! Just like the new bike I bought. I live in New Smyrna Beach as well, so it is very easy for me to respond right away to make sure everything is perfect! Remember, you get what you pay for so come and enjoy this beach house! Once again the beach house was great! Thank you dale! We love to vacation in your home and appreciate all you do to make us comfortable each stay! Glad to have you back at the beach house again! I am also happy you could capitalize on my 10% discount for repeat renters. Thanks for the kind words! I try to provide the best vacation beach house possible. If you rent from me you will not be disappointed! This classy beach home is located in beautiful New Smyrna Beach - voted best beach in Florida for the last 3 years in a row! New Smyrna Beach is low-key and low-dollar. It boasts 13 miles of award-winning, wide, white-sand Atlantic beaches, oodles of quirky shops and restaurants, fabulous fishing and golf. Inexpensive or free area activities include playing or surfing on its wonderful waves, hiking, biking or kayaking, admiring art at its numerous galleries or just unwinding on the shore. 20% discount on published rates if rented within 5 days of occupancy. Long term rental rates are negotiable. Will consider rentals less than 1 week during off-season. CLEANING FEE OF $135 PER RENTAL.